Why Chavundray wrote it in Marathi too? Shavanbelagola is an ancient shrine of Jains and its history goes back to at least the time of Chandragupta Mourya, the first historical emperor of Bhaarat, the greater India. (B.C.E. 2 nd Century). He was disciple of Acharya Bhadrabahu, became a Jain monk and migrated to South India with his pontiff. He was known as Prabhachandra. Later he took Sallekhana (Death by starvation). The hill where he took sallekhana is known as Chandragiri. On this hill, the charans (feet) of Chandragupta are carved at the highest pick of the hill in his memory. In the south of Chandragiri, another hill known as Vindhyagiri is situated. On this hill there is the famous statue of Gomateshwar Bahubali. This 58.8 feet high statue is the highest monolithic statue in the world. Chavundrai, the General and Prime Minister of King Rachmalla II of Gang dynasty built the statue under the guidance of Acharya Nemi Chandra Siddhant Chakravarti. Near left foot of this statue, we see a line in old Nagari script and Marathi language ‘Chavundraye Karviyale'. 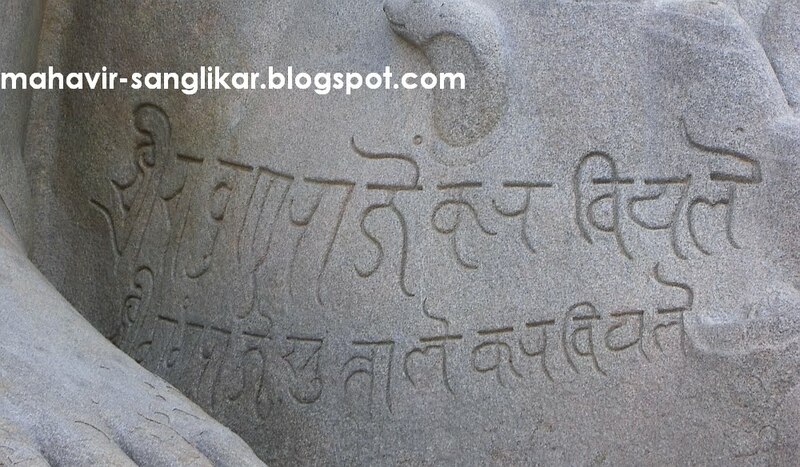 This is the first inscription of Marathi language. It means ‘Done by Chavundrai'. It is written in C.E. 981. The same sentence is written in Kannad and Tamil languages also. Shravanbelgola is situated in the South Karnatak and it is very far from the Marathi speaking area and Maharashtra. It is interesting to know that why the Sentence ‘Shree Chamundraye Karviyale' is written in Marathi? To discuss this issue, we should know about the Marathi speaking followers of Jainism. According to the 2001census of India, about 30% of total Jains in India are residents of Maharashtra. A large number of them are migrated from Gujarat, Rajasthan, and Madhya Pradesh. Although they are fluent in Marathi language, their mother tongues are either Gujarati or Rajsthani or Hindi. They are migrated within last 100 to 200 years. The Marathi sentence ‘Shree Chavundraye Karviyale' was surely not for them. On the other hand there is a large number of Jains in Maharashtra who are migrated from Karanatak. They have migrated mostly in 13th century and afterwrads. They are originally Kannad speaking people and although they are Marathi speaking people today, even today they can understand and speak Kannada language. So the sentence ‘Shree Chavundraye Karviyale' was not for them also. So the question arises: For whom the Marathi sentence was written? The only answer could be: It was written for the Marathi speaking people of that era, i.e. 10th Century, who were visiting Shravanbelagola in large number at that time. And why they were visiting Shravanbelagola? Because they were followers of Jainism. And where are they now? The answer is that they have been converted to other faiths. It is well known fact that till 13th century masses in Maharashtra were following Jainism. We can confirm it by the history of Kadambs, Rastrakoots, Chalukyas and Shilahars. But later due to political, social and religious conditions people started to get converted to other faiths, especially after the fall of Shilahars. I would like to write about it in next part of this article. I am a proud marathi Jain. I dont get any reference like Jain Chaturtha or Pancham except in Maharashtra. And many portals e.g. JainMatrimony.com or Shaadi.com dont provide a Digamabar Jain - Chaturtha or Pancham options on their portals. Mahavir, can you start a topic like which are the possible sect or sub-sects of our marathi Jain baandhavas? yeah even though hordes of Jains are staying in Kolhapur and Sangli dists. The association under Kolhapur Math is called Dakshin Bharat Jain Sabha. the learned Kannadigas practically knew two languages. slowly switched to Marathi during seuna Yadavas, who themselves were of Kannada origin with names of the Kings like Dhadiyappa, Bhillama, Vaddugi etc. So, the Ganga general Chavunda Raya probably wrote in Karnatak Maharashtri when he said "Shree Chamundraye Karviyale". It could also be a later graffiti work by some unknown person ? The inscription at the foot of the Jain monolith is in Konkani, not Marathi. The lord is called Gomateshvara and the word Gomateshvara apparently comes from Konkani word 'gomaṭo' which means beautiful or handsome and īśvara meaning lord.